My girlfriend is out of town with friends so I’ve had a bachelor/wargamer weekend and gotten a lot done on my Infinity figures. 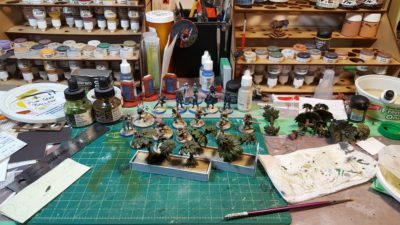 The workbench – planters in the foreground, various Haqqislam figures behind, and the usual clutter around the edges! Click for larger. The planters are foamed PVC sheet and mat board offcuts, and the trees are from Games Workshop — at one point they produced a rather nice set of modular plastic “tropical trees” that vaguely resemble palm trees and are a lot of fun to put together. Like pretty much everything that GW ever does that’s actually interesting, these seem to have vanished from their website, which is a shame. I picked up most of a set a while ago when I bought a whole mixed batch of wargaming stuff off someone locally who was having to downsize. 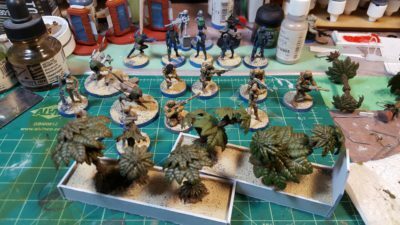 Closeup of the planters – done with the old GW palm trees – and CB Haqq figures in progress. Click for larger, as usual. Closeup of the figures and planters. The dark blue figures in the background are various Hassassin Bahram soldiers including three of the infamous Fiday assassins. The figures closer to the camera include a pair of Remotes on the left, an al’Hawwa sniper and al’Hawwa hacker, a pair of Hafza infantry in lower left, and a quintet of Djanzaban medium infantry on the right – two rifles, a sniper, an HMG, and a hacker, all stalwarts of the Qapu Khalqi sectorial force in Haqq.